Todd Pletcher was seen making a beeline for the parking lot shortly after he was assured that the two horses he saddled in the Hopeful had come back from the race safely. There was no reason for him to hang around for the eleventh. He didn't have a horse running and Linda Rice had sewn up the training title already. The meet's two leading trainers entered 11 runners combined on Monday's Labor Day card. Neither trainer won with any horse. Rice began the day one up on Pletcher in the standings, despite running almost 60 horses fewer than he. All the races she won were races that were scheduled for turf. Her victories numbered 20. Her winning percentage was nearly 30 percent. 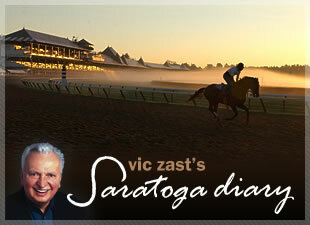 It was the year of the girl at Saratoga. In addition to Rice becoming the first woman to win a Saratoga training title, the powerful 3-year-old filly Rachel Alexandra beat older boys in the Woodward. Danielle Hodsdon dominated the rider corps in the steeplechase races and won on the flat in her very first try at that. Janet Elliot was inducted as the first female trainer in the Hall of Fame. Speaking of trainers, an old one but a good one was back in the spotlight on Monday. D. Wayne Lukas, recently turned 74, saddled the 2-year-old Dublin to a smashing Hopeful Stakes victory. Lukas predicted success openly in the week leading up to the race. Those who doubted him faced embarrassment as well as lost a three to one profit on every dollar bet. Dublin ran the kind of race that would make owners think of May. The son of Afleet Alex, also a Hopeful winner, is a long-legged, 1200-pound colt that glides over the track effortlessly. In typical Lukas fashion, he finished out of the money in his first race against five next-out winners. He then broke his maiden in his second start, winning by 3 ¼ lengths in 1:09.45 for six furlongs. Although Lukas had a good meet, the hottest trainer on the grounds in the last several days was Bill Mott. For example, his horses won the eighth and the ninth. The eighth was a 5 ½ furlongs allowance sprint on the grass. The ninth was the $100,000 grade III Glens Falls Handicap. Corey's Coming took the former. Mushka won the latter. Kent Desormeaux rode both. By the way, Mushka was one of two more million-dollar babies that took to the track this meet. In winning the co-feature, she, a $1.6 million yearling purchase, fared considerably better than Crystal Moment, a $1.2 million horse that finished fourth in the sixth. Perhaps the $400,000 made a difference. As for numbers that matter, the meet ended down - but only slightly. NYRA immediately issued a statement that despite the declines, Saratoga 2009 was a rousing success. Few can argue with that. Ken and Sarah Ramsay, who led all owners with 12 victories, and Godolphin, that won four grade I stakes and was dq'd from a fifth, in particular, liked the math.